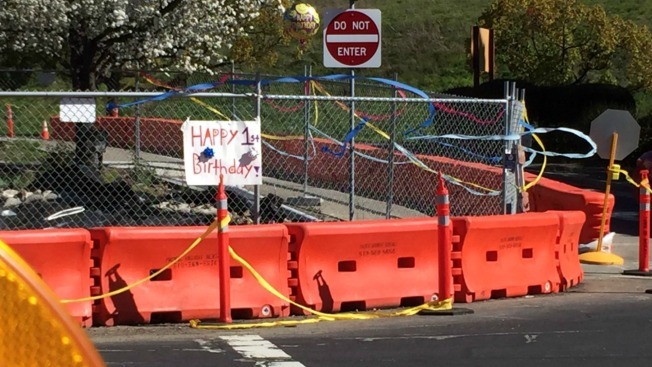 A group of witty highschoolers in Moraga celebrated an unusual birthday Monday morning — that of the massive sinkhole plaguing Center Avenue and Rheem Street. The teenagers, all hailing from Campolindo High School, thought it would be funny to mark the 365th day of the sinkhole's existence by decorating the construction site with a "Happy Birthday" sign and balloons, cards and streamers. As many will remember, the sinkhole knocked out a gas line and left hundreds of PG&E customers without a source of heat for multiple days. A traffic light also toppled after being swallowed up by the hole. Pictures of the sign and decorations hit social media Monday morning, leading many to applaud the mysterious pranksters for their valiant efforts in getting the city's attention. The masterminds confirmed they were the culprits by providing text messages showing them planning the joke and buying the supplies to NBC Bay Area. Kendall Schmidt, 17, is credited with coming up with the idea. She told NBC Bay Area that it would serve as a nice reminder to the city that the sinkhole is still there, waiting to be fixed. "My friends and I have been joking for a while about how long it's taking for the sinkhole to get fixed, and I thought it would be funny to put Birthday signs on it at the one year anniversary," she said. Schmidt had been eagerly counting down the day with a note on her calendar. She said she's "absolutely stunned" at the attention the joke received. "I thought that, at the most, we might make the police blotter or something," she said. Student Michael DeRodda, who also helped decorate the fence, says the group is headed off to college next year but may have to stage a special reunion if the sinkhole isn't fixed. "We've been waiting and waiting for the city to fix it," he said. "But, you know, it's still there."